John Gullo of the American Dream Foundation producer of the Dennis Forbes Memorial Tournament in Ogden, Utah. John Gullo is a pickleball ambassador with the USA Pickleball Association for the Ogden Utah area. He is also a patron of pickleball. John and his wife Karen donated $60,000 to build a four court complex in a local park and John’s foundation, The American Dream Foundation has donated pickleball equipment to most of Ogden’s schools, contributed to building the Little Valley Pickleball Complex in St. George, Utah and produced the Dennis Forbes 2013 Memorial Tournament last July. John was successful in the franchise business and now he’s giving back. Clearly, John is passionate about pickleball. He began playing in 2008 as a way to get exercise and have fun after heart bypass surgery. John has lost around 70 pounds playing pickleball. He plays for hours almost everyday. Last week David, a partner at PickleballCentral.com, got to chat with John. John was thrilled with the success of the The Dennis Forbes 2013 Memorial Tournament and is planning to produce the 2nd Annual Dennis Forbes September 3-6, 2014. John will expand the tournament to a $42,000 prize purse and is planning for open competition in two age categories — a Master Category for ages 18-50 and a Legends category for ages 51 and older. The 2013 tournament was an invitation, “Best of the best,” tournament. John is working on a grant from the City of Ogden to construct stadium seating in Ogden for 1700 pickleball spectators. John’s dream is make the Dennis Forbes Memorial Tournament the Wimbledon of pickleball. With John’s passion and the strength of the pickleball community, we think John’s dream will become reality. 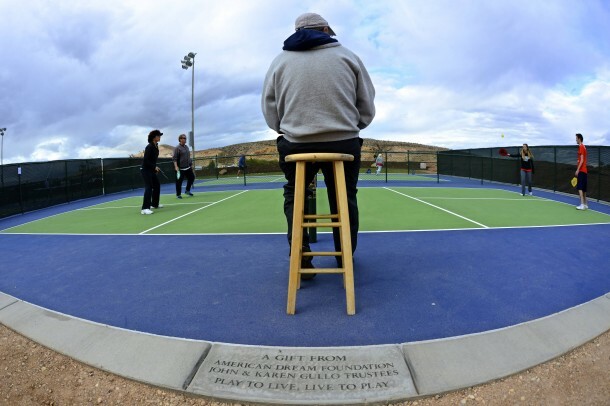 John and Karen Gullo’s American Dream Foundation contributed to the construction of the Little Valley Pickleball Complex in St. George, Utah. If you love to play Racquetball or Pickleball, but can’t find a court or some friendly games to get going, welcome to the club. Utah has proven to be a tough place for racquetballers/pickleballers. Seems there are a lot of us who want to play – but there is very little in terms of local organization. So having little to no options, I decided to create the Utah County Racquetball and Pickleball Meetup group to get something going. This group is intended to be a starting point to growing a Utah-based Racquetball-Pickleball community where people can self-organize games, events and get information. So get in on the action! Join for fun, or if you are joining for competition or for a ladder, please mention that specifically in your intro, or separate email. I love PB, live and work in Montana, and drive through St. Geo a couple times a year, so, have you a url for the pickleball complex? Is it open to the public? etc. etc.